At Hammaker East, our commitment to safety is at the heart of everything we do. In addition to emulsions being 100% recyclable, making them the most recycled product in the world, we maintain high training standards and job-site safety for both our crews and the public. 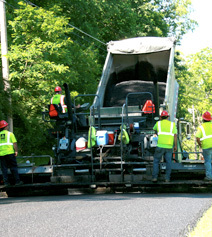 Our research and development team focuses on creating innovative solutions that combat road surface issues from the foundation to preservation and repair. Our specialty products carry numerous benefits that include being environmentally friendly, which requires minimal crews and quick curing times; and extending surface life. This core value of safety allows Hammaker East to continue to be successful for years to come. As environmental concerns become increasingly important for all of us, it’s worth noting that we offer specially developed GREEN cold mix asphalt that emits low doc hydrocarbons. These emissions are much lower than the standard mixes and materials provide. Additionally, only Hammaker East can deliver this kind of high-quality cold mix asphalt product with on-the-spot convenience. Emulsions are as environmentally friendly as asphalt can be for a crude oil product and are 100% recyclable, making them the most recycled product in the world.